Hawaii is a beautiful travel destination, no argument. 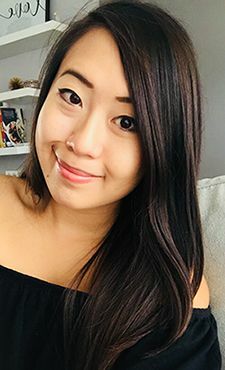 Yet visiting the Hawaiian Islands was never a high priority for me on my travel bucket list - despite friends and family always telling me about their dreamy vacations. Last Summer I was so fortunate to win a sponsored trip for two to Maui with the Ka'anapali Beach Resort Association. And it dawned on me: it was a sign that Gordon and I were meant to honeymoon in Hawaii. 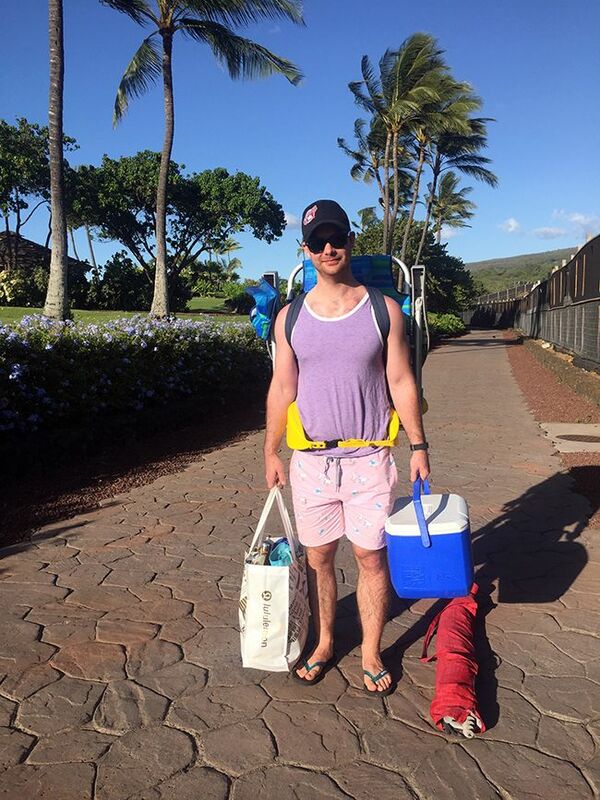 At the beginning of December we packed our bags to escape the Canadian winter for 9 full days of sunshine, ocean and Aloha. Once we returned all I could think was "why have we not visited Hawaii sooner?" We had an unforgettable time exploring all that Maui has to offer and plan to return again in the near future. 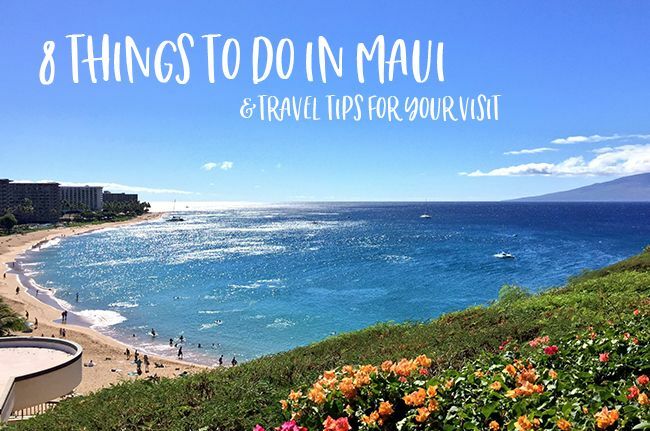 In the meantime, I've put together some must-do activities and travel tips for those of you planning a visit to Maui! Watching the sun rise to signal a new day is one thing, but watching the sunrise above the clouds at an elevation of 9700 feet is completely different. Whether you drive to the summit yourself or join a tour group, it really is quite the experience and a must-do when you visit Maui. We chose to drive to the top of Haleakala ourselves as it allowed us the freedom of exploring the summit at our own pace, and we didn't find the winding roads of the drive to be too difficult or nauseating. It takes about an hour to drive top to bottom each way, so pack some snacks and enjoy the views after the sunrise! 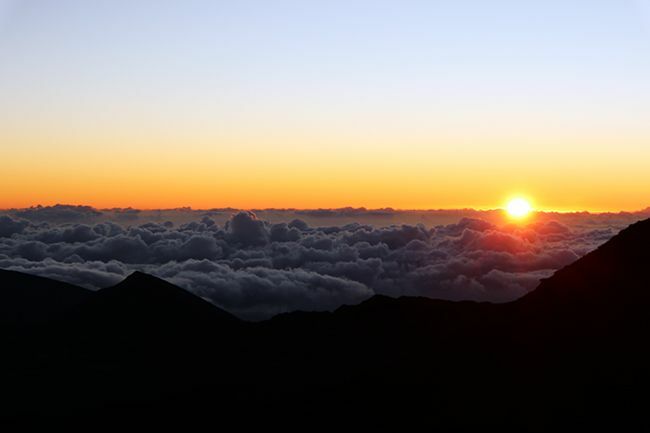 If you are driving a vehicle you must book a vehicle reservation to enter Haleakalā National Park to view the sunrise. Reservations are $1.50 and can be made online up to 60 days in advance of your visit. Entrance fees (per person) need to be paid on top of the reservation fee. Plan to arrive at the summit at least 1 hour before sunrise - this will guarantee you a parking spot and a good viewing spot. Dress warmly (consider a blanket). You are at a high elevation and the temperatures hover around freezing. We packed hoodies, mittens, hand warmers and coffee and still felt cold! Plan this around the beginning of your trip - as you haven't adjusted to the local time yet your jet lag will help you wake up early for the drive. Trust me on this one! Maui is an incredible location for snorkeling. The waters are a beautiful shade of blue and give a very clear view of the coral and marine life. Our favourite spot to snorkel was at Black Rock in Ka'anapali by the Sheraton Maui Resort & Spa. The water is calm and there are so many different fish right by the shoreline so you don't need to swim out too far. Snorkel sets are available for rental by the beach from the hotel, but if you plan to do lots of snorkeling I would recommend bringing or buying your own set as the rental costs can add up. Black Rock is also a popular spot for cliff diving, and if you stay into the evening there is a nightly cliff diving ceremony you can watch! For affordable snorkel rentals, visit Snorkel Bob's or Boss Frog's (Boss Frog's offers $1.50 snorkel sets but they are very, very basic). If you're planning to purchase a snorkel set, Costco in Maui has them at a great price (~$40). It may look silly, but I highly recommend renting a flotation belt for snorkeling! It takes away the stress of staying afloat and you can focus on exploring the water. We also enjoyed snorkeling at Maluaka Beach (also known as Turtle Town for the turtle encounters), but the water is a little more rough and you need to bring your own gear. We didn't make it out to the Molokini Crater on this trip, but it will definitely be on our itinerary for our next visit. The scenic town of Hana is located on the eastern shore of Maui and the drive along the highway is winding and scenic. Before our trip I read that the Road to Hana is more about the trip than the destination, and it really is true. There are incredible views of the ocean and waterfalls, hiking trails and beaches to explore, and you'll find multiple swimming holes along the way. 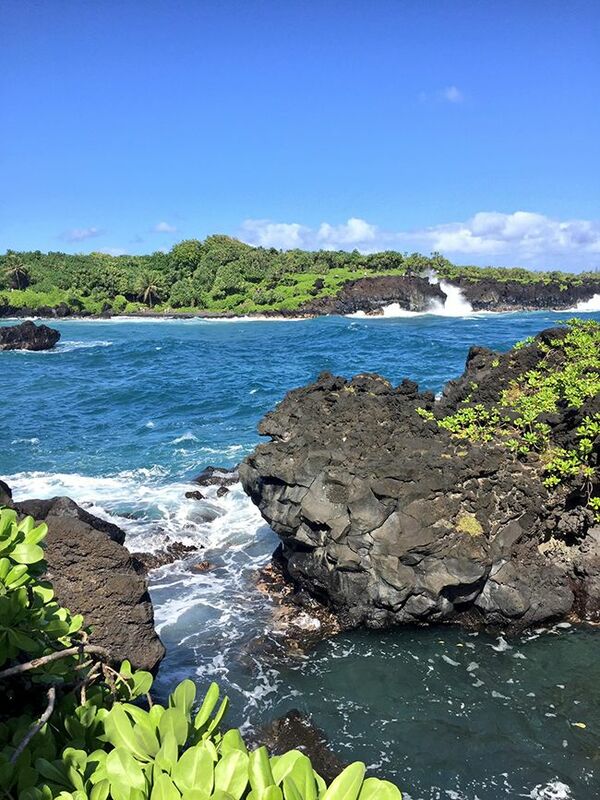 Although the length of the Hana Highway is only 52 miles, budget 3-4 hours to complete the drive each way as you will be making multiple stops and the highway is narrow and full of hairpin turns and single-lane bridges. Plan to start your day early. On our trip we left Kuhului at 7:30 am and were back in Paia around 5:30 pm. By departing earlier than most, we were among the first to arrive at most stops and didn't find it too crowded. I also highly recommend you plan your trip to Hana at the beginning of your vacation as you aren't adjusted to the time change yet. I tend to get nauseous easily and found the hairpin turns of the Hana Highway to be tolerable. Pack some ginger candies or ginger-based Gravol and sit in the front seat if you're worried. Pack a lunch and lots of snacks in the car. There are stops for food along the way but they tend to be quite busy. We were able to enjoy our picnic lunch with the view in the photo above! We purchased the GyPSy Guide for the Road to Hana and would highly recommend it. For $5.99 from the App Store it was more than worth the money - the app works offline via GPS and gives you stories, information, and recommended stops along the way to Hana. On the drive back from Hana you also get to learn lots of Hawaiian history. Pack a good pair of shoes for walking. Some areas are very muddy and rocky. I would recommend packing beach gear into the car - there are great swimming holes and you never know if there's a spot you may want to stay and enjoy a bit longer! 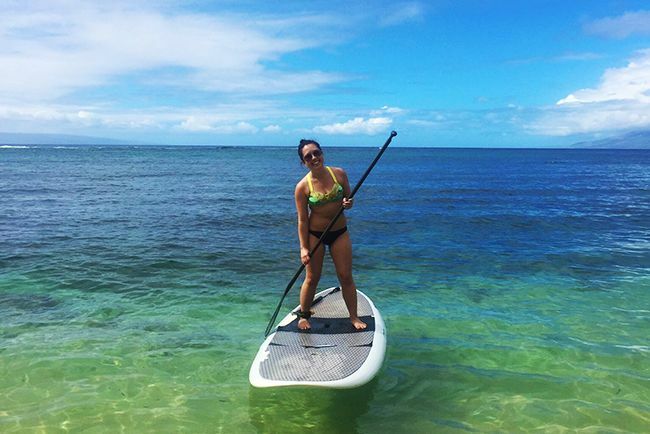 If you aren't the strongest swimmer but still want to get out onto the water, taking a stand up paddleboard (SUP) out onto the ocean is a great idea. Napili and Kapalua Bay on the northwest side of Maui are known to have calm waters sheltered by coral reefs, so it's the perfect place to SUP or snorkel. The bay is a popular place for families and lots of people enjoy snorkeling thanks to the ideal conditions and clear waters. I could see plenty of fish from my board and a turtle even popped its head out of the water to say hi! SUP rentals are available at Kapalua Bay for $40 per hour, but you can rent boards from many different businesses in Maui for cheaper, especially if you rent for a couple of days. Poke - we tried many places but our favourites by far for quality and price were at Tamura's Fine Wine & Liquors and Foodland. Hawaiian Kettle Style Potato Chips in Sweet Maui Onion Flavour - you can grab huge bags at Costco for a great price. Li Hing Mui gummy candies. Acai and Lilikoi flavour Hi-Chew. You can't leave Hawaii without attending a luau! 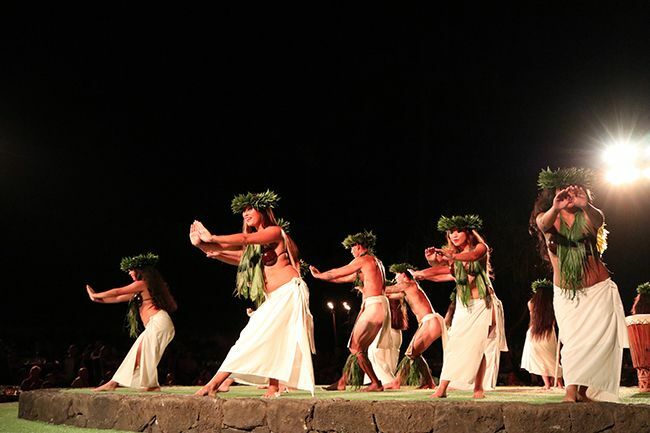 A luau is a traditional Hawaiian feast that is accompanied by live dancing and music. There is pre-dinner entertainment, free flowing drinks from the open bar, and a dinner buffet with traditional Hawaiian dishes. We spent our first luau experience at the Old Lahaina Luau which we read was one of the most authentic in the area. It was a night of great entertainment and the dinner buffet was fantastic! Along the waterfront in Lahaina is Fleetwood's, a restaurant and bar owned by none other than Mick Fleetwood. Given the musical influence, Fleetwood's on Front Street is known for their daily entertainment which you can enjoy while grabbing a meal or bites during happy hour. 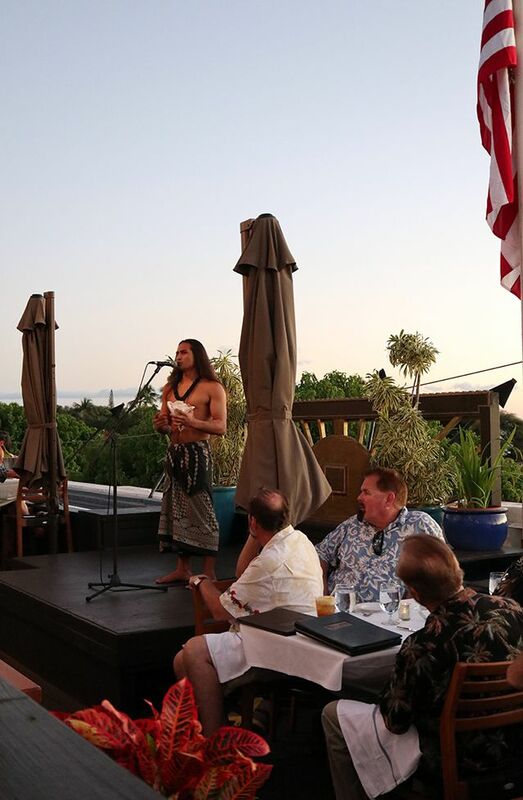 On top of the musical talents, Fleetwood's is home to a daily sunset ceremony on the rooftop starting at 5:45pm (5:30 on Saturdays). We learned a thing or two from the Hawaiian Kumu as we watched the sun set on another beautiful day in Maui. 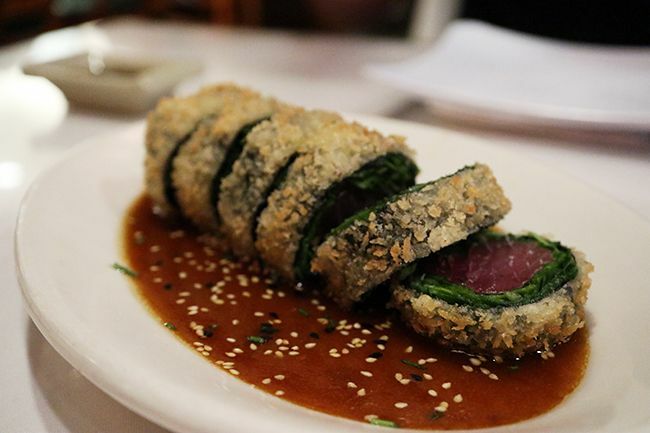 Sansei Seafood Restaurant in Kihei is well known for their Japanese menu, but what many visitors don't know is that they host late night karaoke from Thursday to Saturday starting at 10pm. Aside from having a good time singing some of your favourite songs inside the restaurant, you can satisfy late night cravings as the sushi menu is 50% off. Gordon loves karaoke and I love sushi, so we planned a visit for our last night in Maui. The restaurant was packed and we had a fun night! As you can see there are so many things you can do on a trip to Maui. While this list may seem extensive, there are so many other activities I would have loved to do or areas I would have loved to explore but didn't get to on our honeymoon. That just means we'll be back to this beautiful island again in the near future! 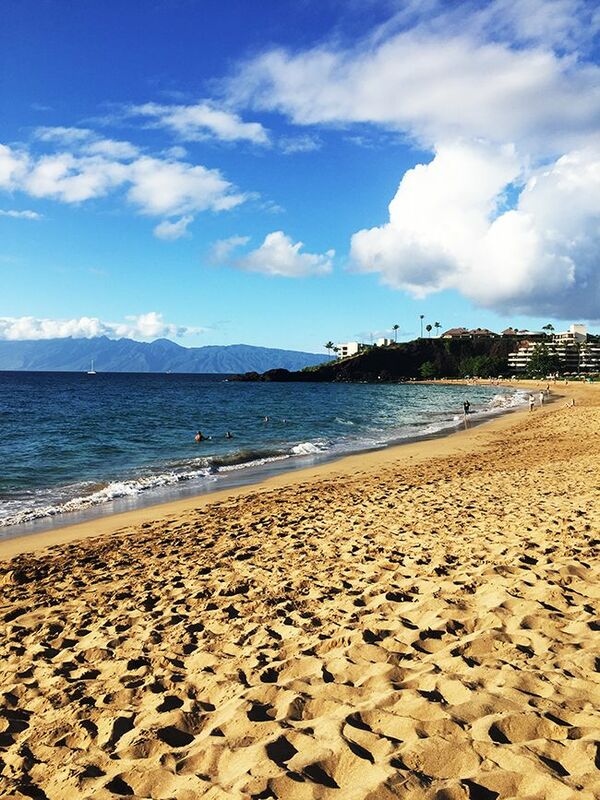 If you've been to Maui and have a must-do activity, please let me know! I would love to add it to my list for our next trip! March in Edmonton is always a delicious month as diners can look forward to the Downtown Business Association's annual Downtown Dining Week. This year from March 8th - 17th you can enjoy prix-fixe menus for lunch ($18), dinner ($30/$45), and weekend brunch ($18) at the 49 participating restaurants in the downtown core. For 2019, Downtown Dining Week has gathered a record number of participating restaurants for the 10 day event. It's a great time to try out a new restaurant or visit your favourites, as the multi-course menus are attractive and the prices are very reasonable and often feature dishes that aren't on the regular menu. 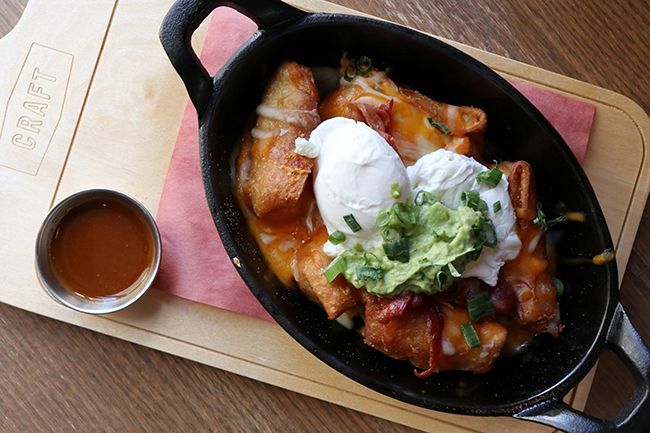 While weekday schedules may not always accommodate time to dine out, I'm happy to share that for the first time ever, 11 restaurants will be offering $18 two-course brunch menus on both weekends over the course of the dining week. 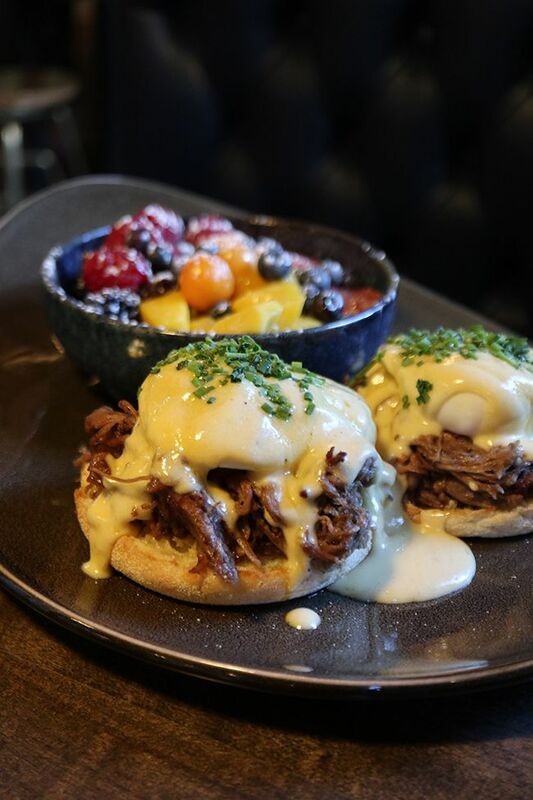 Weekends were made for brunch, and I've got a little sneak peek of some of the dishes you can find on menu this year during Downtown Dining Week. The Blue Plate Diner is a staple on 104 Street, serving up globally-inspired comfort food for lunch, brunch, and dinner 7 days a week. For weekend brunch during Dining Week they are offering Harissa-Spiced Shakshuka paired with an Orange Juice Mimosa for $18. 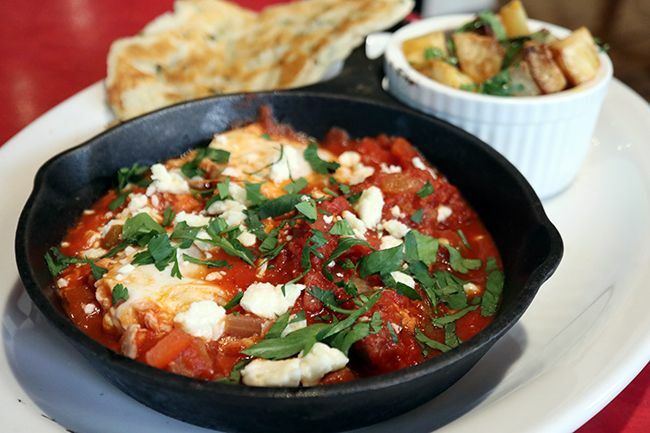 The shakshuka is fragrant with a touch of heat and features 2 eggs simmered in a North African tomato sauce. Finished with crumbled feta cheese, it is delicious served with pillowy Turkish flatbread and crispy Lebanese-style potatoes. This dish won't be around for long as it is an off-menu special for Downtown Dining Week. At the corner of Jasper Avenue and 109 Street you will find Central Social Hall, which is more than your average restaurant or bar. It's a gastropub where good food, drinks, and friends come together any time of day to unwind and enjoy the social atmosphere. 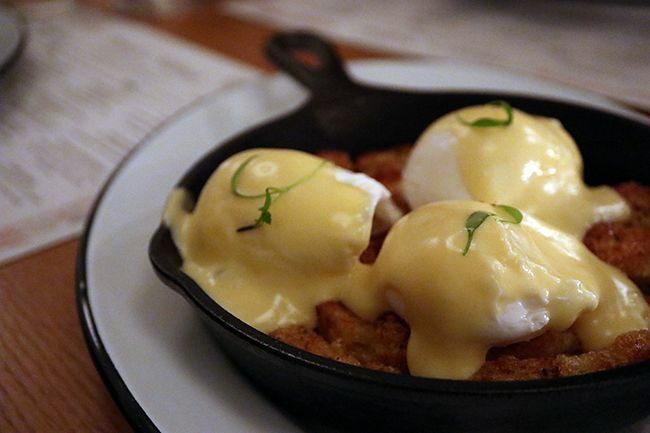 For Downtown Dining Week, Central Social Hall is offering a two-course brunch for $18. You have the choice to pair Belgian Waffles, The Cure (an incredible brunch poutine), or the Oil Country Benny with either Made-to-Order Doughnuts or Nutella Cheesecake. I know what you're thinking - the choice is difficult! 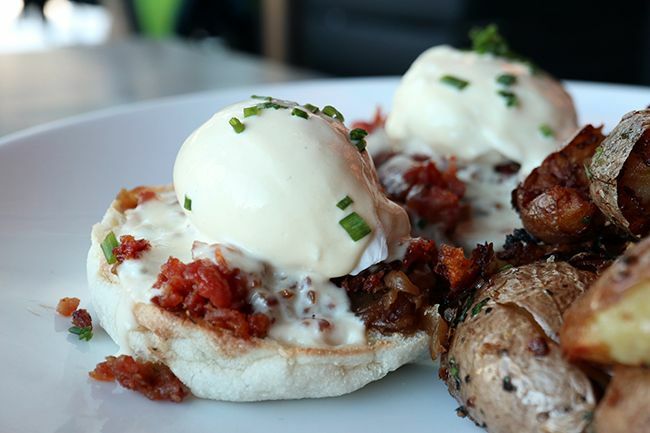 The Oil Country Benny brings together locally-sourced Italian sausage, bacon, caramelized onions, and two perfectly soft poached eggs on English muffins. Finished with a roasted poblano and white cheddar sauce, the sweet and savoury notes are a winning combination. The dish is served with house greens or crispy potatoes, and I recommend the latter - you can trust me on that one. As part of Downtown Dining Week, Central Social Hall has partnered with Herbologie, a new local spice merchant in Edmonton, on one of their desserts. The Made-to-Order doughnuts come as an order of three and are deep fried and rolled in icing sugar that's mixed with Herbologie’s cinnamon from Tanzania. 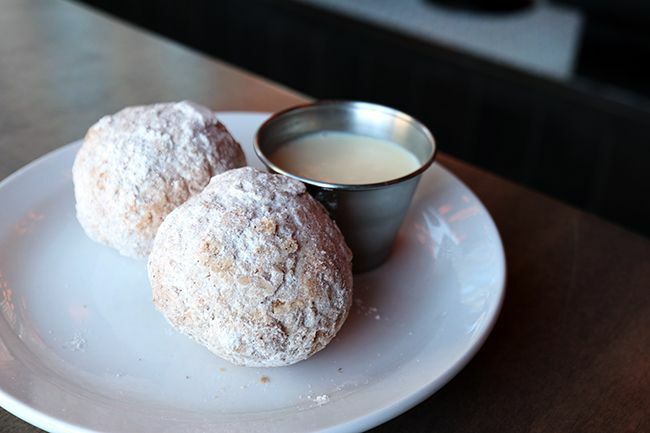 The doughnuts aren’t your usual light and fluffy doughnut holes, but rather are a little heavier and remind me of little fried bread balls. 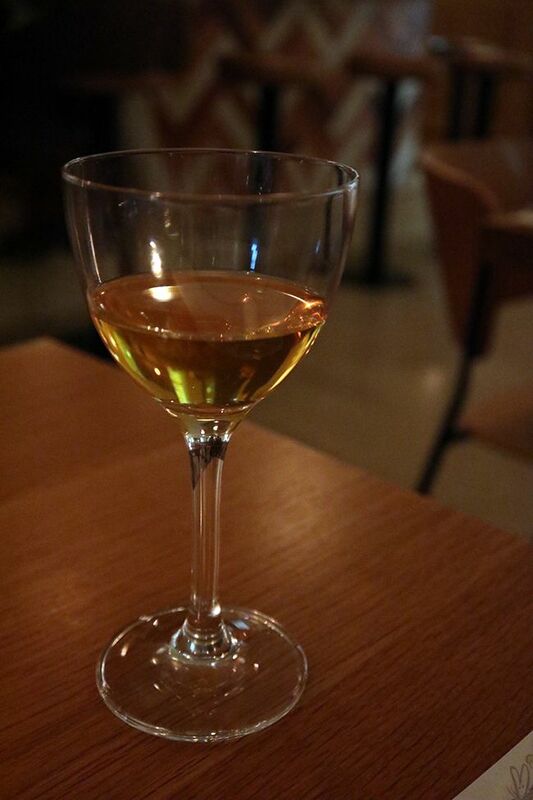 The cinnamon has fragrant notes of pine and citrus which are enhanced by the rosemary anglais dip. They aren’t much to look at, but the textures and flavours make them a must-have to round out your brunch. Craft Beer Market is a great casual spot to grab a bite and a beer (there’s over 100 available on tap!) in the downtown core. For Downtown Dining Week you can get a three-course brunch for $18, which is seriously good value. Start your meal with locally sourced yogurt, then choose breakfast tacos, a taquito skillet, or a farmhouse benny and finish with snickerdoodle waffles or housemade cookies. The Red Racer IPA Taquito Skillet was calling my name and the dish was well worth the calories. The crispy taquitos with tender pulled chicken were cheesy and had a nice kick of heat to them. Combined with the soft poached eggs and creamy guacamole it’s a dish I could indulge in over and over again. DOSC Restaurant (Drunken Ox at Night Sober Cat in the Morning) occupies a beautiful space in a heritage building along 104 Street. Cafe by day and restaurant by night, DOSC is offering three two-course options for $18 during Downtown Dining Week. I opted for the Brisket Benny which features Montreal spiced brisket on an English muffin and is finished with a maple hollandaise. The pulled brisket was moist and tender and the subtle hints of maple in the velvety hollandaise was delightful. The accompanying fresh fruit bowl was beautifully filled with mangoes, blackberries, raspberries, blueberries and gooseberries and was topped with a light syrup. It’s a brunch combination that’s indulgent but not too heavy. 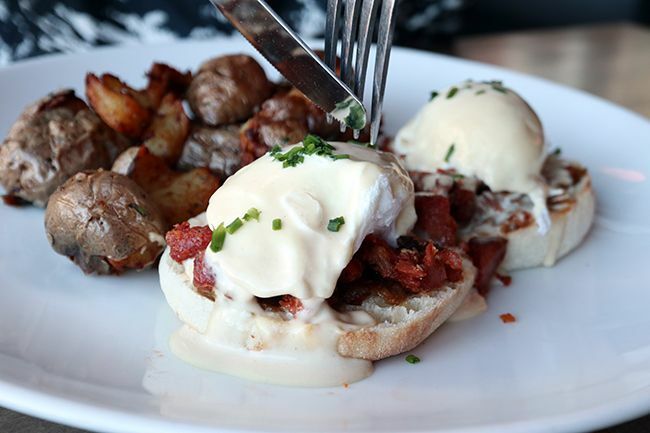 If you are a brunch lover there are plenty of great options during Downtown Dining Week. Head on over to the Downtown Business Association’s website to browse the full menu listings from the 49 participating restaurants and start making your dining plans - most restaurants accept reservations too! Wherever you make your reservations, happy eating! And Happy Downtown Dining Week! *Disclosure: This post is sponsored by the Downtown Business Association. Views expressed in this post are solely mine. This post is 100% my opinion, and as always, my priority is to you, the reader, to present an unbiased, thorough review. A 100-year-old heritage brick building in the Brewery District is the home to Wilfred's, a contemporary diner and cafe. The space is gorgeous - lit with natural light, accented with beautiful blush pink tones, and brightened up with a playful mural of Mayor Wilfred in his town. 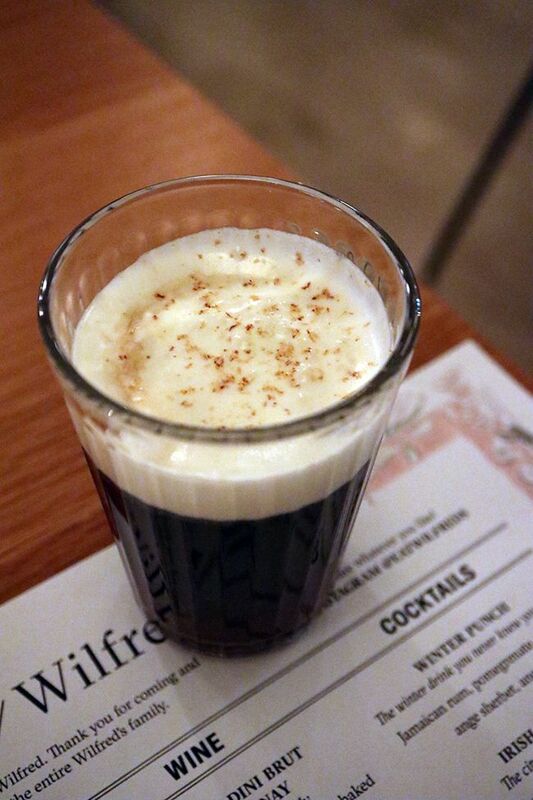 Wilfred's bills itself as a place to meet and gather, serving breakfast, lunch, dinner, and weekend brunch. 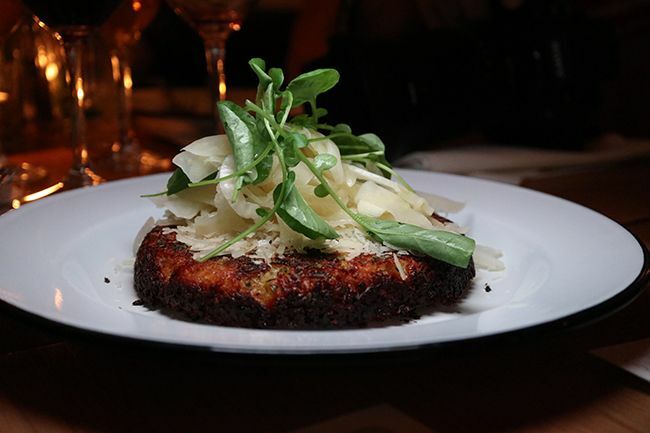 The menus offer a contemporary take on classic dishes for an elevated diner experience. To kick off the new year Wilfred's has launched a new dinner and cocktail menu, and I had the opportunity to taste a handful of dishes and drinks. The dinner menu is split between lighter fare and larger dishes but sharing is encouraged to get a better taste of the menu. The offerings are comforting and affordable and there's something for everyone. 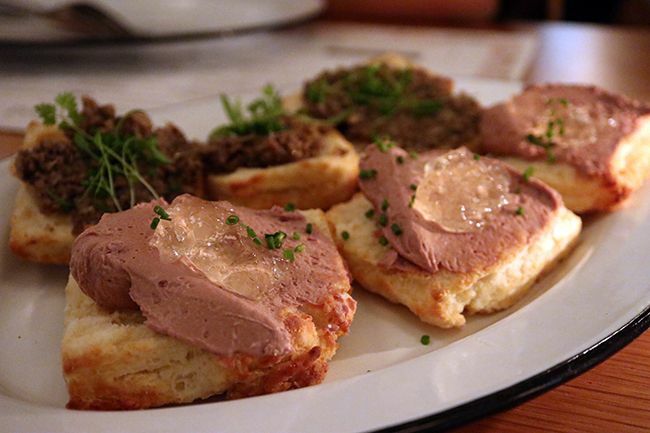 The House Biscuits ($10) are crispy and flaky and come with your choice of velvety chicken liver mousse or mushroom herb duxelles. Of the two the mousse was my favourite, it was very well seasoned and smooth. 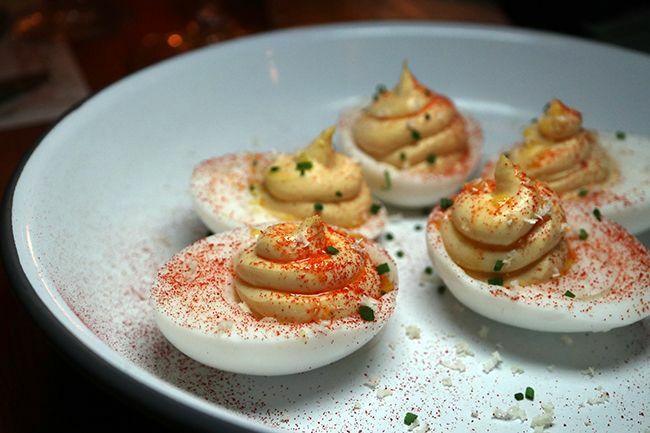 The Deviled Duck Eggs ($5 for 2) feature Four Whistle Farm's duck eggs with dijon, horseradish and chives. The eggs are creamy and tangy little morsels with a hint of smokiness, making them perfect as a pre-dinner snack. 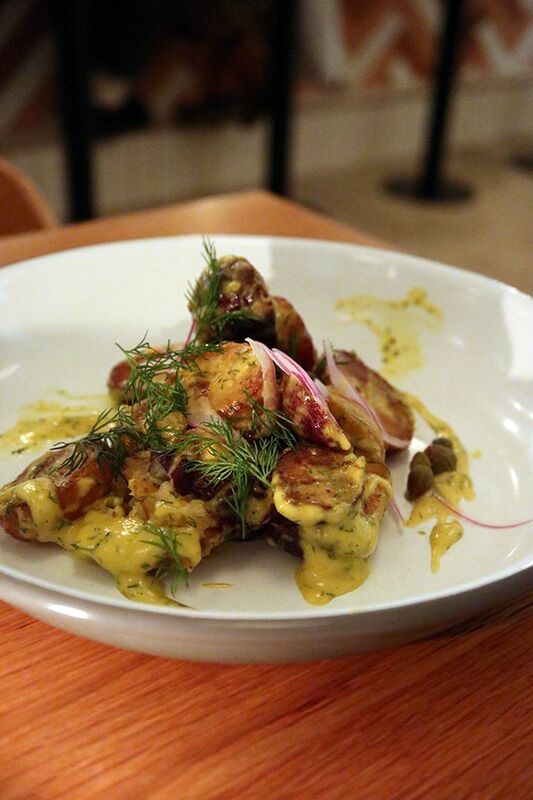 Roasted baby potatoes, mustard dill vinaigrette, capers, onions and dill come together to make the Warm Potato Salad ($12). The dressing has all the right notes - it's sweet, savoury, acidic and well balanced. It isn't quite what comes to mind when you think of a potato salad, but this is a very good kind of different. 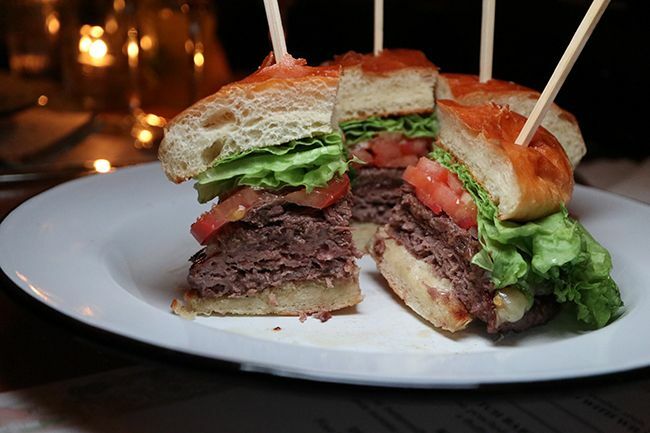 An exciting addition to the dinner menu is the new Bourbon Burger ($20) featuring a Meuwly's beef patty with bourbon braised short rib, lettuce, tomatoes and aioli on a soft brioche bun. It's a juicy, hefty burger patty, and would be delicious for dinner with a side of fries. 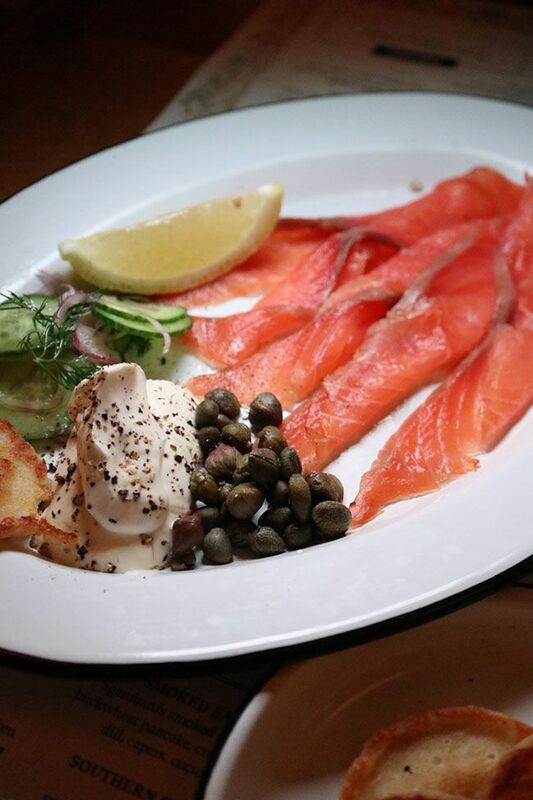 The Smoked Salmon and Pancakes ($18) is a light, shareable option for dinner featuring Sgambaro's smoked salmon. The salmon is served with buckwheat pancakes, creme fraiche, fresh dill, capers, and a cucumber salad. My surprising favourite of the night was the Southern Cornbread ($12), made with sweet corn and sourdough. The cornbread was fried to a beautiful golden crisp which broke to reveal a creamy, sweet and savoury bread pudding. Paired with the refreshing fennel and parmesan salad topping I could eat this all day. 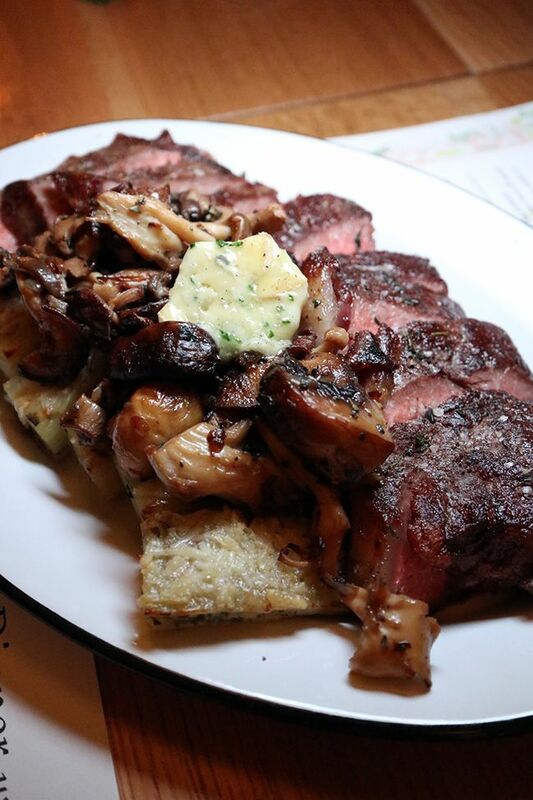 One of the largest offerings on the menu is the One Month Dry Aged Striploin ($36). 10 oz. of medium rare striploin is served with flavourful cambozola butter and scalloped potatoes. The meat is flavourful, tender, and such a good deal for the price. 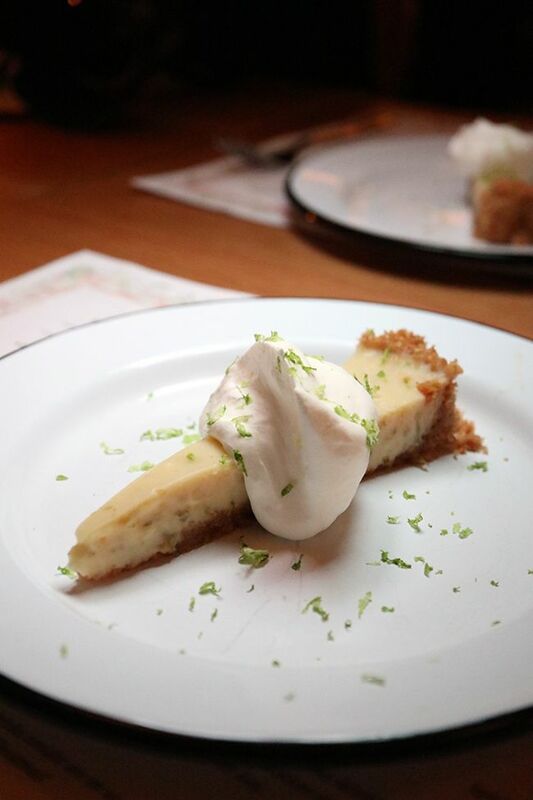 To round off the meal we enjoyed the Kaffir Lime Pie ($6). 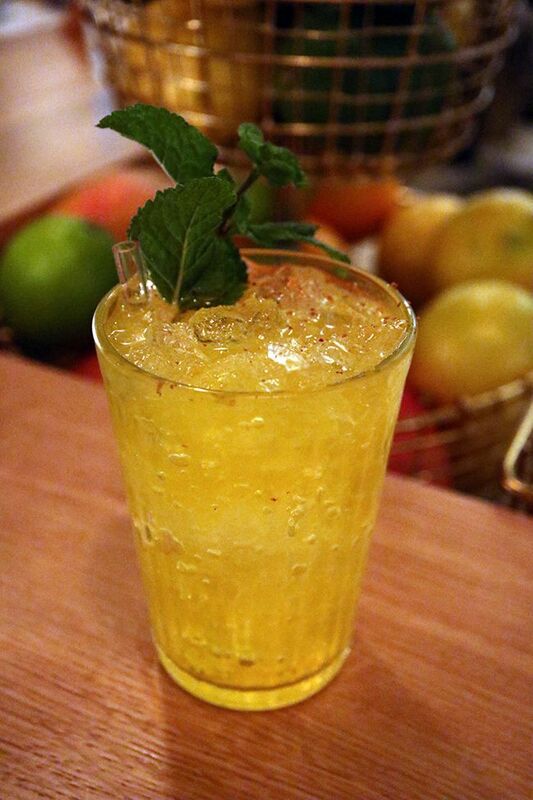 It was tangy, sweet, and so fragrant from the kaffir lime - a must have to end your meal. Being the go-to neighbourhood spot to meet and gather, the menu at Wilfred's has great offerings at affordable prices and the menu can cater to vegetarian, vegan, and gluten-free diets. Wilfred's is on the way to becoming the prime location for all meals of the day, but considering their delicious cocktails it is an excellent spot for post-work drinks or dinner with friends. *Disclosure: I was invited to a media night at Wilfred's. Views expressed in this post are solely mine. This post is 100% my opinion, and as always, my priority is to you, the reader, to present an unbiased, thorough review.